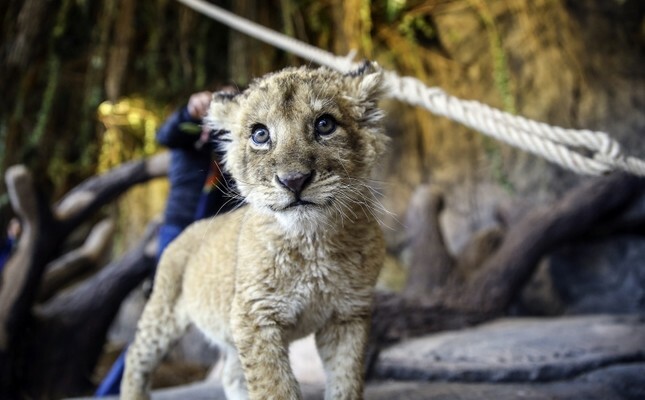 Aslan Park, the world's third zoo exclusively consisting of big cats, has opened to visitors in Istanbul. The zoo cares for more than a dozen specimens of seven different species including lions, Siberian and Bengal tigers, pumas and leopards under the watchful eye of two highly qualified veterinarians and five technical staff. Designed to the standards of the European Association of Zoos (EAZA), the felines were chosen from among documented specimens which have been living in zoos for at least four generations. The felines currently consume a total of 135 kilograms (297 pounds) of meat, chicken and fish daily, according to the staff, with plans for an additional two black leopards, four white lions, two servals and two tiger cubs. The births of two leopard cubs are currently awaited to be the first such births recorded in Turkey, with guests allowed to nurse the zoo's cubs under the control of staff. "The feeling of being among these beautiful animals in this beautiful environment must be a wondrous feeling for visitors," Kusat Bilgi, working in Aslan Park's life support team, told Anadolu Agency. The zoo, which spans to eight decares, is to be Turkey's first park of its kind and has attracted a large number of visitors since its opening in Istanbul's Tuzla Viaport Marina on Oct. 29.